Assign automatic discount rules for your customers with Prestashop Accumulative Discounts. Set discount levels the customer gets after reaching a configured total order amount. Users can view information on the current level and discount, amount left to proceed to the next level as well as overall discounts info. 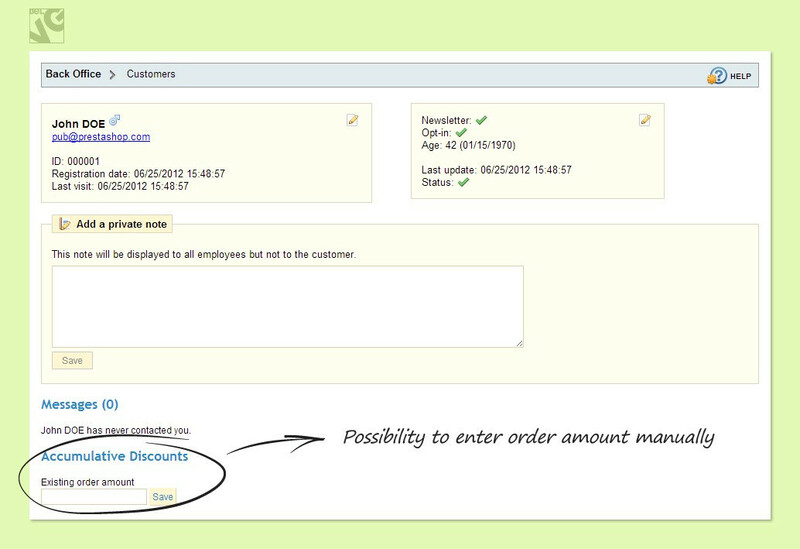 Use the extension to configure a flexible discount program and generate interest among present and potential customers. Set accumulation levels and corresponding discount percent. Select statuses of orders whose amounts you want to be calculated. The extra Accumulative discounts tab appears in user account menu. It includes information about the current user level and discount, total order and left to proceed to the next level amount, overall discounts and levels info. In the back-office, edit customer total order amount manually, if necessary. Visit the demo back-office, entering guest@yahoo.com/guest123.